Last year we brought you news (here) of the post-apocalyptic thriller THE TRIBE, from director Roxy Shih and writers Ian Paxton and Chris Manask. Today the film makes it U.S. debut film release through Terror Films and will be available on several VOD platforms. Platforms hosting the release include: iTunes, Amazon Instant, Google Play/YouTube, Vudu, Xbox Live, Sony PlayStation, Vimeo on Demand, I Bleed Indie and 3 Roku channels (Free Flix Tonight, 24 Hour Movie Channel, Free Grindhouse Flix Tonight). To the left you can check see the official poster and below we have an exclusive clip called 'Sisters Divided' and the films official trailer. After a global pandemic, few survivors remain in the world. 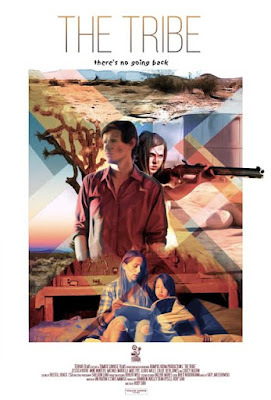 On a remote ranch, three sisters fight to survive in the arid wasteland, equipped with the lessons their father taught them. When strangers in search of refuge come knocking, Sarah (Winters), Jenny (Rothe) and Danika (Chloe Jones) must fight back against growing intrusions, if they hope to survive. In a world where the lines between friend and enemy are blurred, the sisters struggle to decipher whom they can trust...even among their own family.